This latest adventure in home food preparation was my daughter's notion, upon noting that the aisle in our local HEB set aside for housewares and appliances had a new section for home canning supplies; including a sort of starter kit for novices; a large light-weight enamel lidded kettle, with a rack and some implements to shift around the jars ... of which there were also a nice assortment in various sizes. 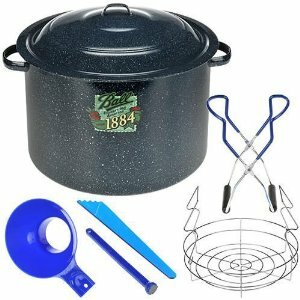 I was certain that we had a huge canning kettle in the garage – a gift from a military friend who was moving to another state – but we couldn't readily find it, as the garage is stuffed with items that my daughter has bought for that residence of her own which she hopes to have one day. But we might have sold the darned thing at the big clearing-out-of-useless-possessions yard sale that we had last year, anyway. So, following her last big payday, she purchased the kit, a Ball recipe book and some flats of jars, and ever since, we have been experimenting with certain of the fruit and vegetable recipes. We are anticipating a bounty from our garden, in any case – already some of the cucumbers are monstrous in size, and if all the green tomatoes on the plants that we have come ripe at the same time ... send the search party to look for us buried underneath a couple of bushels of tomatoes. 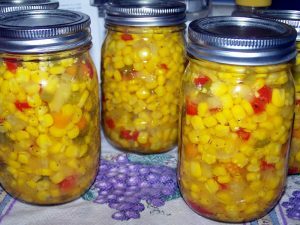 This is a recipe for a pepper and corn relish which I copied out of a Thanksgiving issue of Gourmet Magazine, lo these many years ago. 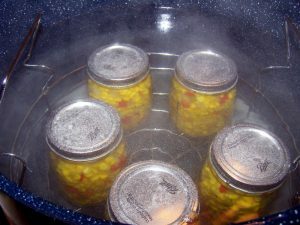 This relish which can be eaten fresh, or processed in the canning kettle for fifteen minutes. It makes about 5 pint jars. 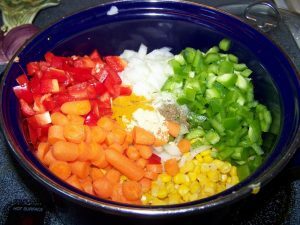 Combine and simmer for half an hour: 5 ½ cup fresh or frozen corn kernels, 1 finely chopped red bell pepper, 1 finely chopped green bell pepper, one medium onion, 2 carrots, also finely chopped, 1 ½ cup sugar, 1 teasp dry mustard, ½ teasp celery, ¼ teasp turmeric and 1 ½ cup vinegar. Next weekend, we may be going to Buda for the Annual Wiener Dog Races ... and we're starting another garden project; a raised bed in a relatively unused corner of the yard. Enjoy! Want a San Antono Golf Course Home?